Hydrogen is important in many current industrial processes and is envisaged to become even more important in the future both as a raw material and also as a secondary energy carrier. At present, almost all the total hydrogen demand is met by the use of fossil fuels, (for example by steam reforming of natural gas) adding to global warming, despite the fact that pure hydrogen could be simply produced by water electrolysis. The reason for this situation is the high electrical demand for water electrolysis, which results in a hydrogen production cost that is currently uncompetitive for commercial retail when traditional technologies are used. In this respect, a distinct market opportunity is opening for alternative, energy efficient, methods for the commercial production of hydrogen. As fossil fuels become ever more scarce, hydrogen prices will continue to increase. This factor combined with increasing hydrogen demand and environmental concerns leads to an urgent need for commercialization of new hydrogen production methods. In this context, the first chapters of the book focus on alternative hydrogen production processes from a range of biomass derived precursors, by classical steam reforming, CO2 sorption enhanced steam reforming and dry reforming, while the later chapters aim to complete the energy cycle by discussing the electrooxidation of the hydrogen and syngas (CO + H2 mixture) products and their valorization for energy conversion in electrochemical devices. The authors of the book are selected, leading world experts in their fields, from three different continents; a factor that underscores the tangible global urgency of the topic. The reduction of greenhouse gases is effectively our current focus in order to have a more sustainable life and environment. In this context, the main focus of this book is hydrogen production processes and hydrogen electro-oxidation reactions. These two joint aspects will allow to propose a catalytic/electrocatalytic solution to the environmental problems. Understanding the properties of catalytic materials and catalysis parameters governing chemical and electrochemical reactions in reforming reactions and energy conversion devices, such as solid oxide fuel cells, are the main topics of this book. The book begins with a chapter addressing the hydrogen production by steam reforming of biomass renewable resources and biomass tar. The reactivity of different catalytic materials, mainly molybdena and vanadia-based catalystys, as well as their advantages and disadvantages in the steam reforming reaction has been addressed. The second chapter reports the study of steam reforming coupled with CO2 sorption. The authors focused on the development of a bifunctional material capable of sorber CO2 and being active and stable in steam methane reforming at unusual temperatures. The third chapter presents a review on the recent advances in the catalytic dry reforming of methane, alcohols and biomass tar. The authors propose a discussion on preparation methods and physico-chemical properties of most recent catalytic materials used in this process. A special attention has been paid to the different strategies to minimize the carbon deposition problem. Emphasis is also given to the plasma, microwaves, solar energy, and electrical current technologies associated to dry reforming reactions. The forth chapter focuses on the applicability of bimetallic catalytic materials in the dry reforming of methane. Thermal, structural, textural, and catalytic studies have been emphasized. Moreover, the electrocatalytic performance of hydrogen and biogas electro-oxidation reactions has been studied by impedance spectroscopy. The fifth chapter reports the history, concept, operation principle, electro-oxidation reaction mechanisms, and the anode component of SOFCs, addressing recent works in the field. Emphasis is also given to the preparation of electrocatalyst and how the synthesis parameters could affect microstructure and electrochemical properties. The sixth chapter is also addressed to discuss anode materials, mainly perovskite-type oxides, for electro-oxidation reactions. The authors propose a comprehensive discussion on the development of electrode materials with combined properties of structural stability, electronic and ionic conductivity, thermal and chemical expansion, and electrochemical activity. 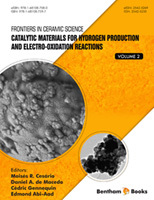 We would like to express our gratitude to all the eminent contributors for their excellent contributions and we believe that this e-book will be a reference to academic/industrial scientists from chemistry, physics, and materials science interested in the catalytic materials for hydrogen production and their valorization in electro-oxidation reactions.